There have been a series of conflicting journal articles regarding the utility of menu board calorie posting in affecting change and often folks like me will latch onto methodologies in order to explain results that we might not expect. Putting aside the evidence-based conclusions, today I want to offer an indirect proof that menu board calorie posting will help people navigate caloric choice. 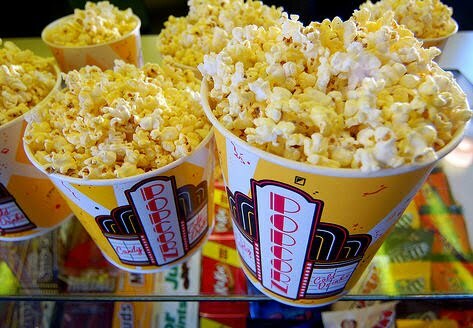 According to Bloomberg, movie theatre conglomerates are lobbying the American congress to exempt them from the food labeling law that would require they post the fact that their large popcorns contains pretty much the same number of calories (1,460) you'd find in 6 McDonald's hamburgers (1,500). Of course if menu board calories didn't impact sales, there ought not to be any reason to care, and it sure ain't the cost of changing the actual menu boards as guaranteed their lobbying efforts costs are orders of magnitude higher than making new signs. I know, not an evidence-based study but certainly one which suggests to me that when faced with some of the more obscene caloric realities out there, diners (and movie goers), will in fact choose differently.